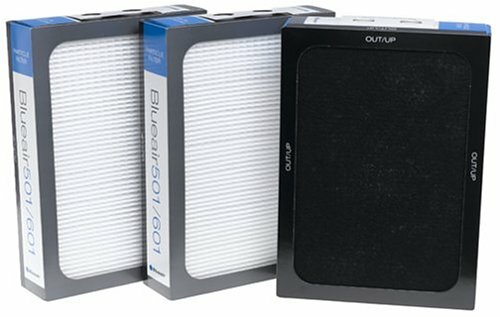 Replacement Particle Filter for Blueair 500/600 series air purifier (set of three) for the Blueair model 501 and 601 air purifiers. One complete filter change - 3 standard HEPASilent filter of polypropylene (traps particles) and activated carbon (removes odors and gases). I just purchased these filters are they do not match the picture. I have owned my purifier for a couple years now and have bought several sets of replacements. This is the first time that I received filters without the additional black carbon filter. The most recent set are just the white particle filter. Yes, I know they sell several kinds of different filters, but I pulled up one of my old orders and clicked through to the product so I would expect to receive the exact same item. And not matter what, the picture shows the filter with carbon, which is definitely not what they shipped.